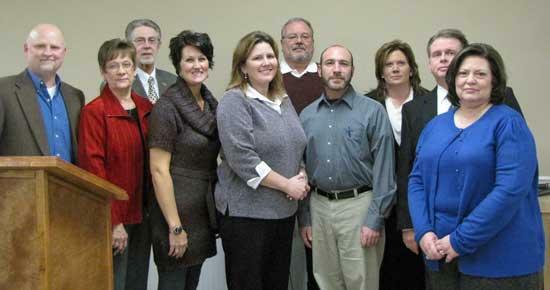 2011 CHAMBER OF COMMERCE BOARD - Front row, L-R, Mike Vaughn Joann Tate, Tarron Johnson, President Michelle Fowler, Neal Appelbaum and Jeanne Melton. Back row, Glenn Steakley, Ron Fryar, Vice President Jacque Head and Doug Combs. The annual banquet of the Historic Cannon County Chamber of Commerce was held Thursday night at the Senior Center in Woodbury. This event is held to install the new administration for 2011. The dinner was catered by Mitchell Murphree of "The Kitchen" which is housed in the Cannon County Arts Center and also a restaurant in Murfreesboro. Doug Combs of radio station WBRY was the Emcee for the evening and as always did an excellent job. After a very delicious meal Doug started the meeting. Combs reported on the many events that the Chamber had been involved with in 2011 and how many people had contacted the Chamber for information about our county. The Chamber hosts or co-hosts several city and county wide gatherings throughout the year such as, but not limited to, the Fall Color Car Show and the annual Winter Merchants open house right before Christmas. help aid people who are looking to settle into our community. Combs, a former president of the Chamber, then recognized outgoing board members and officers. Leaving after a term of three years are Terry Bogle, Rick McFerrin, and Cliff Swoape, who had been with Chamber for six years. Combs then recognized the incoming officers and board members. Michelle Fowler is the new Chamber President, Jacque Head is the Vice President and Mindy Gunter is the Treasurer. Board members for 2011 are Neal Appelbaum, Tarron Johnson, Joann Tate, Travis Hancock (second three year term) and Anita Parton also a second three year term. Also on the Board are Ron Fryar, Anna Pittman, Jeanne Melton, Regina Reed, Glenn Steakley and Michael Vaughn. Fowler addressed the audience and thanked everyone for their support of the Chamber promising to keep the Chamber strong in the community. She recognized Ron Fryar of the Cannon Courier for being so supportive of the Chamber. She also spoke about the people who volunteered that kept the Chamber going. People such as Doug Combs, Mike Gannon, Joann Tate, Sue Patrick and Thea Prince for their outstanding work with the Chamber. Combs then introduced Mike Gannon, County Executive and Sue Patrick who stood in for her ill husband Mayor Harold Patrick. They both were there to present to Swoape plaques for his outstanding volunteerism with the Chamber. Gannon read a Proclamation for the county in honor of Swoape who could not be there due to conflicting events. Gannon proclaimed that January 27th be known as Cliff Swoape Day in Cannon County. These proclamations are put into the official records of Cannon County and will be there forever in the history of this county. Combs, when talking of Swoape, compared him to a car that had no reverse, because when he gets going on a project he never turns around and he only has one speed and that is all out. Combs and Gannon both voiced that Cliff was very instrumental in Cannon County achieving the 3-Star status that it now holds. At the last of the meeting, Combs took the time to address the audience in a personal and professional way to tell them that he had been unanimously voted into the position of Vice President of the Tennessee Broadcasters Association. This is a very prestigious position for Combs. It is also a paid position and he will no longer be able to oversee the day to day operations of his radio station. This puts him in a very important position for the broadcasters in Tennessee. He will be in Nashville, but his job will take him to the Nation's Capitol frequently. Fryar, Publisher of the Cannon Courier and the Murfreesboro Post says that this is a big move for Doug and his wife Melissa. Fryar says that Doug is certainly qualified to excel at the job. The Courier wishes him well; his new job starts Tuesday the 1st of February. Doug told this reporter that a former employee of WSMV Radio will be assuming the morning slot as news director of WBRY. I see some very good people in the group. I wish the very best for these new chamber of commerce members.